I just can’t win! Help! Last night I was running a nice 5x6 four color job. On 100 lb cover, a nice cover (cost $30 for 250 8/5x11 sheets). Was running the yellow plate, the press was running great. after about 50 sheet the V-50 started picking up 4 and 6 sheets at a time. I was able to catch it before it enter the gripper. I started running one sheet at a time and I it look to see how to correct it, than I noticed the press stopped, 6 sheets made it half way on impression. I can’t get the press to move. If I get one other fellow to help turn the flywheel with me, do you think I get the sheet though the press? I the big feet sucker are doing a great job of picking up more paper than needed. I could suggest a very large pipewrench on the rim of the flywheel to back up the press (or push through, but guessing the press stalled early in impression) BUT that can be fraught with hazard (breaking an internal key or some such). I know a lot of people love Bigfoot suckers, but sometimes I think they are too efficient. A large complement of Miehle Vertical sucker feet are more useful to me, since I can arrange the suckers for the different stocks I intend to run. If I get the press working again, I throwing the big feet sucker in the street. I was so happy, I had the right amount of ink, coverage was great, impression on the area was what I wanted. Possibly 2 pronged attempt to free off.! Pull the Detent pin out to disengage the Cylinder rotation, with substantial Tommy bar in the cylinder inching holes, accompanied by redundant 2” drive belt or 2” (load lugger) type ratchet strap/strop, around the Main flywhell, once past 360 degrees wrap around, the harder the pull the tighter the grip, a minute dash of rosin possibly if it does slip. No damage or marks. Reversible instantly for the *Rocking over* backwards and forwards if desirable.! Followed by more than one pair of hands on, substantial pull on the Strop and especially important the *FEEL* on the Tommy bar indicating ANY or No minute movement from the jammed cylinder before any further disasters. The Big Foot is probably not being used correctly. They are set in the same position as the regular Miehle shoe about 3/4 to one inch in from each front corner of the sheet. 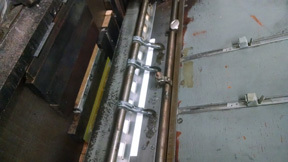 A dummy shoe to regulate pile height has to be used—this is a regular Miehle shoe with any of the sucker inserts placed on the sucker bar in the middle of the sheet. It is not connected to air. Without this dummy shoe, the Big Foot can not regulate the rate of the pile height advance. I often tape one or more layers of chipboard to the bottom of the shoe to decrease pile height. The pile has to advance up to the feeding position. Setting the pile too high to start with will absolutely guarantee multiple sheet pick ups. And once at correct height, the pile height advance will stop for one or more sheets before it works again. If it advances on each sheet, within several sheets there will be multiple sheets being picked up, so it is necessary to know how to adjust the mechanical part of the pile height mechanism, which is easily put out of whack. The Big Foot itself is adjustable as to angle of the stem when the stem with a good rubber sucker on it touches the sheet being picked up and the up and down reach of the sucker is also adjustable—using the right sized Allen wrench. Pickup and delivery of the sheet to the feed table works off the cams at the front bottom of the press, and work the same as with regular feeder shoes. The paper pile has to have a little wiggle room, not set tight against the front stops, and the back/side stops need to have about 1/16” gap to the paper pile. The proper amount of air has to be put into the pile from the front pile blast and the 2 corner blasts. The amount and force of air has two controls, one at the valve at the bottom of the feed table post and another one at floor level on the main air line from the air pumps. Lots of other air issues, but my guess is that Aaron didn’t have the dummy shoe in place to regulate pile height. And is there a sheet back stop on the feed table? Photos that we can look at of these problem setups go a long way to understanding what the problem is—usually not the equipment but how it is set up. I have learned a lot from the reply on this posting. I guest I misunderstood reading about a dummy shoe in the middle of the sucker bar. And I do have the backset tight against the pile of cover stock. I am posting the sheets in the press. When the sheet delivers to the feed table, or transfer board, there needs to be a little gap between the edge of the sheet and the backstops on the table. The sheet doesn’t always feed cleanly to the cylinder grippers and may have a slight skew to it. When the table lowers to the bottom position of the cylinder travel, the table tilts up slightly, the side guide pushes the sheet over into register, and then the back stops push the sheet up against the grippers because of the table tilt thus covering the air holes and the cylinder will trip and go into impression. If the back stops are set too tight, the sheet can buckle and may cause the sheet to separate from the cylinder trip air holes and cause the cylinder not to go on impression, and then a second sheet will feed in on top of the first. If the cylinder trip knob isn’t set to trip, then the next cycle will take 2 or more sheets into impression, and that’s not good. This can combine with the suckers picking up more than one sheet and as Aaron found out, leads to disaster. 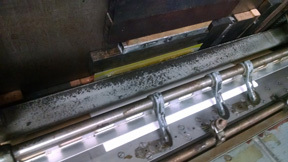 If the cylinder keeps on tripping, even when the sheets deliver one at a time, the quick fix is to take the trip knob off the trip position and then the cylinder goes onto impression each cycle, but this is sloppy and can cause multiple sheet pile ups and either jam the cylinder and/or damage type and plates. The air balance required for all this to work properly can be maddening because there are several ways to approach it. One requirement is for clean air lines at every point in the system starting with the air filters on the air pumps. Often overlooked are the air holes on the feed table that hold the sheet to the table after delivery of the sheet to the grippers. This is also part of the cylinder trip cycle. And air holes can be covered with tape where they lay outside the sheet area. Lots of nifty things to understand on a Vertical. My longest press run on a V-50 was 140,000 impressions on an 11x17 sheet, full coverage. I spent about a week watching the press run, occasionally putting in new stock, removing printed sheets, and adding ink to the ink fountain. It was a fairly uneventful week. And that’s the way it should be with a Miehle once it is set up properly. Every press run shouldn’t be a disaster in the making. Aaron, how about a picture of your gripper bar? Right now I need to get the paper that you see in the photos out of the press. 90% is down on impression and I can’t get the cylinder to move to bring the stack of jam back to release. Arron, all you need to do is to loosen the 2 Allen bolts on the gear side of the cylinder….you only need to release the 2 on the gear side of the cylinder. Get the Allen wrench with the “ball” end. Good luck. Carl. It’s a lot of fun, I have to remove the side panel to get to the arms holding the transfer table off. I loosen the two hex head bolts on the operators side, but it didn’t help. The transfer table needs to come off to get to the non-operators side.